To ensure maximum comfort, especially in winter weather conditions, your clothing must consist of a minimum of three layers. Performing closely together, each layer plays its own part and cannot be taken away. Therefore, whatever the context of use is, weather conditions or the level of warmth sought, all three garments are required. This is the basic rule to follow. The first layer is often the one whose importance is underestimated. Yet, its role is crucial: this garment is in contact with your skin and must keep you dry. In winter conditions, the most insidious enemy is your own body moisture. If that humidity is not released, you will no longer be comfortable and you will be cold as soon as you reduce your level of physical activity. To fulfill their role, undergarments must be long and fitted. That’s why the majority of basic garments on the market are made of stretch knits. 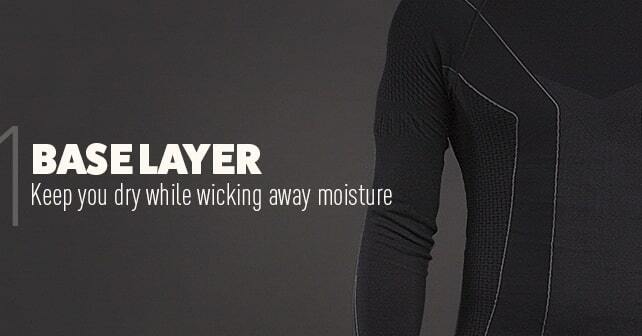 Fitted to your body shape, the fibres can do their job better by moving perspiration out towards the middle layer. Time to put away your sweatshirt, t-shirt and jeans! The cotton fibres they are made of absorb moisture, and once the fibres are wet, they lose all their thermal properties. No matter how many layers you add, if you have sweat, you will be cold! So, you must avoid cotton garments at all costs for the base layer. For intense physical activity, it is better to consider fabrics with a high percentage of polyester, polypropylene, nylon or polyamide. Easy to clean, these synthetic fibres have good stretch, do not absorb moisture, or very little, and dry very quickly. Because they retain odours, it is important that they have antimicrobial and anti-odour treatments. Naturally antimicrobial and soft to touch, merino wool is a good choice if you need more warmth. Merino wool fibres absorb more than 33% of their weight in moisture, which is trapped inside the fibres, so that the fabric will remain dry to the touch. However, once really soaked, more time will be required for drying. Garments with a high percentage of merino wool are also more expensive than those with synthetic fibres. Most of the base layer garments available on the market have blended fibre content. The different properties of each fibre are thus optimized to obtain high performance fabrics that wick away perspiration and regulate your body warmth. 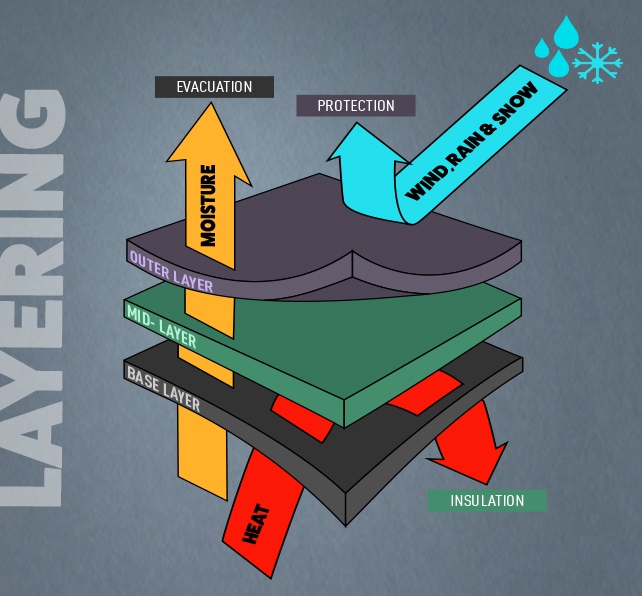 The mid-layer acts as an insulator. It allows body warmth to be retained and repels the cold outside. It must also take over from the base layer and continue releasing moisture to the outer layer. 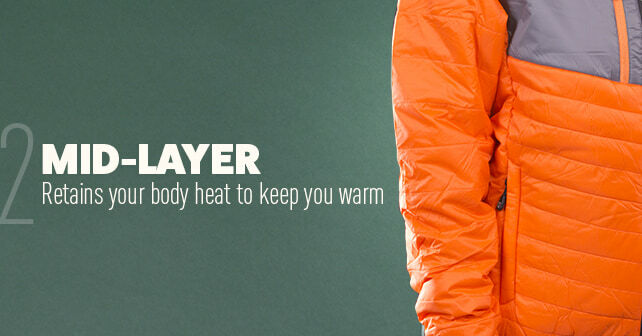 You should choose the mid-layer based on your desired level of warmth. This garment should not be too loose, nor too fitted, to allow for some freedom of movement. Once convinced of the benefit of the base layer, many active snowmobilers are tempted to simply eliminate this mid-layer. 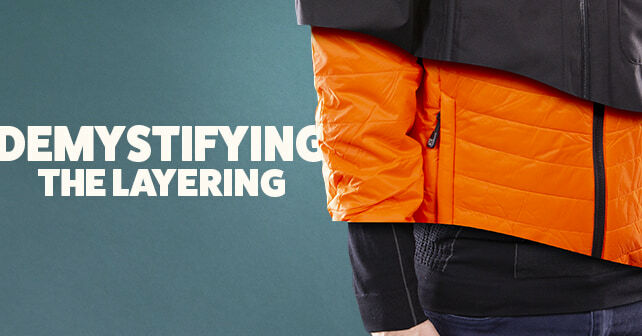 In winter conditions, this garment is extremely important as it allows you to adjust to changes in temperature. If you are too hot, you can store it in your backpack; and conversely, if you are cold, you can add a second layer! Once again, it is better to avoid cotton fabric though it is not altogether prohibited. However, other choices may prove to be more effective as an insulator. A polar fleece jacket is a perfect mid-layer. Lightweight, soft, breathable and comfy, polar fleece is available in different thicknesses that provide varying degrees of thermal insulation. You may also consider down or synthetic insulating jackets. These little puffa jackets are an interesting alternative if you have to add an extra layer. Easy to pack in a bag, they fit nicely under the outer layer and are a great way to keep you warm in-between seasons. Linings are sometimes designed into the outer shells and sold as 3 in 1 jackets which are amazingly practical in northern climates where marked temperature fluctuations are common. As the last defense, the outer layer serves as a shield that must protect you as much from the rain and snow as the wind. It must be worn over other layers and facilitate freedom of movement, but without being too loose fitting to avoid heat loss. All seams must be sealed, and the zippers, water-resistant. 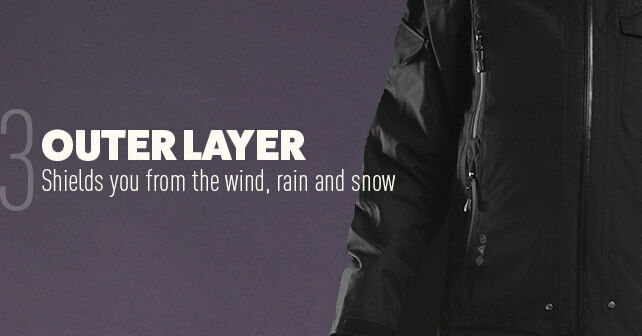 This layer must be waterproof, but also breathable to complement the job of other layers and keep wicking moisture to the outside. If a fabric can both wick moisture away from the body and prevent ingress of water drops, it is because it includes a membrane. When applied or laminated to the outer nylon or polyester fabric, the membranes have pores that are smaller than water drops, making them impermeable, but much larger than a water vapor molecule that can escape. The membrane therefore allows the materials to be both waterproof and breathable. The outer layer need not be isolated since the middle layer acts as an insulator. The shell coat is therefore usable in any season. However, some coats available on the market are suitable for extreme cold conditions and have different degrees of insulation to complete the effect of the mid-layer. Build your suit, layer by layer! The climate varies significantly during a snowmobile season... There are even changes in weather conditions within a few hours. Enjoying spectacular snow panoramas or having fun in the powdery snow can quickly turn into a nightmare if the cold chills you to the bone, or just the opposite, you are like a hot and humid island! Winter enthusiasts will pass on the famous saying, “There is no such thing as bad weather, only bad clothes!” Adopting clothing that complies with the basic rules of layering is a bit like enjoying your own personalized microclimate!